Twitter has just rolled out a major update for its official iPhone app. 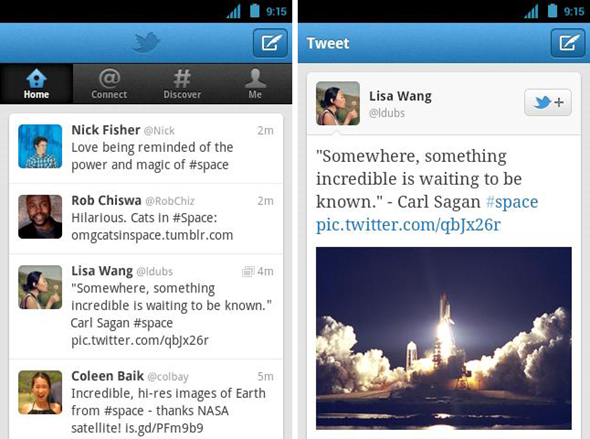 The new update gives Twitter for iPhone a new look and some new features. The app has been noticeably revamped with a completely new interface, where the bottom four tabs have been replaced with Home, Connect, Discover and Me buttons. A detailed explanation of these new features are below. Home – Home is where you view Tweets from the people you have chosen to follow. It’s your personal collection of Tweets, featuring the latest news, commentary and information from the sources you care about. Photos, videos and conversations are embedded directly in Tweets so you can see the whole story at a a glance. Connect – The new Connect section is where you get in on the conversation. It’s the place to see who has followed or mentioned you, retweeted or favorited one of your Tweets. Connect is your way to keep the conversation flowing. Discover – Discover lets you tap into a stream of useful and entertaining information, customized just for you. When you use Discover, you’ll see results reflecting your interests—based on your current location, what you follow and what’s happening in the world. As you use Twitter more, Discover gets even better at serving up more content just for you. Me – The new profile section puts you and your interests front and center. Others can Tweet directly to you and view your lists, favorites, followers, photos and more. The Me tab is also where you can stay current on your direct message conversations. The Me tab is your opportunity to introduce yourself to the world.